PowerPoint is a Microsoft program, but this tutorial applies to any other program you use for creating and designing presentations. Take these documents from the depth of your computer folders and bring them directly to the eyes of your target public. Open the document on your computer with the slideshow editor. Export the document as ".pdf" or ".jpeg" (File > Download as). If you opt for the .jpeg format, we recommend saving the files in a separate folder. Log into your OnSign TV account and click on "Content" on the sidebar menu. Click on the orange "New" button on the top-left corner and hit "Upload File" to load your computer's map with the ".pdf" or ".jpg"-files. 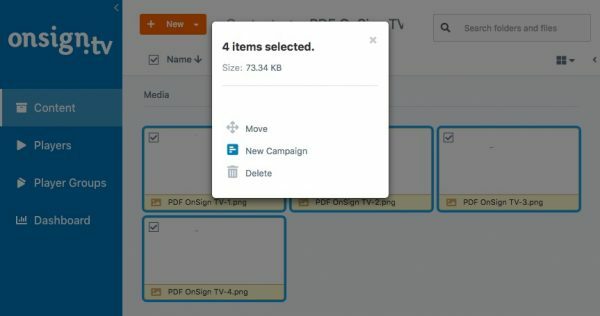 Alternatively, you can simply drag the files from your computer to the OnSign TV platform. Confer how to upload media files. If you upload a single .pdf, you’ll notice a new folder will be created among your folders containing each page of your presentation. Select all document pages with the mouse. Right-click over the selected items and hit "New Campaign". A new pop-up window will prompt on your screen. Name the campaign and adjust how many seconds each item should last on the timeline. Finish by clicking on “Create Campaign". 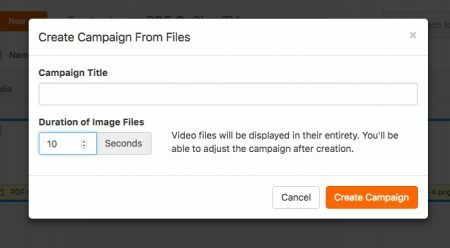 In fact, you can create campaigns with any file format directly from your content tab. Select all items to be included in the timeline and click on "Create Campaign". The new page will load the campaign editor. The items you selected are already placed in the timeline. They will each be displayed for the time you specified and in name sequence. Therefore, double check the items and rename the files if necessary so they appear in the right order. Now you just need to make few adjustments, such as shorten or expand the duration of each item, for example depending on the amount of text on each slide. You can also add image transitions, change the layout in order to add an app, or adjust the items order. Now, simply "Save and Publish"!